In their opening game of the 2012 season--playing in the hostile New Orleans Superdome--the Washington Redskins scored 40 points for the first time in seven years and upset record-breaking quarterback Drew Brees and the Saints. The difference between a dreary 2011 season and the next? It can now be summarized with initials: RG3. Robert Griffin III arrived in the NFL with the eyes of a football-loving nation examining his every feat with the unspoken anticipation stars bring: "What's next?" Having signed four endorsement contracts before his first professional pass, RG3 aimed to dispel the notion that "running quarterbacks" are an endangered species once they leave the college game behind. Playing with a dynamism that brought fans to their feet every time he took a snap, RG3 brought rock-star glow to America's most popular sport. Style and aura, though, will take a football player only so far. What kind of impact could RG3 make as that most endangered species of player, a rookie quarterback? Chronicled here for the first time are the triumphs and trials of Robert Griffin's rise to the NFL, a profile of his natural leadership ability, and his faith that holds it all together. Griffin himself says, "The only thing I fear is God." Blessed with more talent than any Redskins quarterback in decades, Griffin knows physical ability is but one requirement for long-term success in the NFL. Game to game and season to season, challenges must be met with willpower few athletes possess. This is the story of the 2012 NFL Rookie of the Year overcoming those challenges. 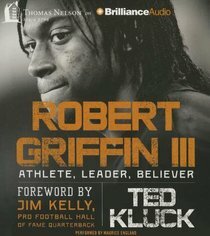 About "Robert Griffin III (Unabridged, 6 Cds)"
Ted Kluck's work has appaered in ESPN the Magazine, Sports Spectrum Magazine, ESPN.com Page2, and several small literary journals. A bi-monthly column for Sports Spectrum Magazine entitled "Pro and Con" won the Evangelical Presss Association award for best standing column in 2003. Additionally, Ted has written two WGA registered screenplays and an award-winning (Damah Film Festival, Sabaoth Film Festival) short film. Ted lives in Lansing, Michigan with his wife Kristen, and son, Tristan.